Mercedes took the entire gleam with it as it unveiled it all new Mercedes Benz IAA Concept 2016. The concept presents power, features and performance of two in a single motor. It is an aerodynamic World champion and a four-door coupe with a design that no one can resist. The ‘IAA’ stands for Intelligent Aerodynamic Automobile and it has….. 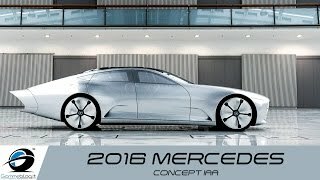 Wait let us not hurry and have a descriptive look at the review of Mercedes Benz IAA Concept 2016 to know each and every treat it is bringing for the automotive world. The interior of Mercedes Benz IAA Concept 2016 has been commendably engraved to present luxury and sportiness. To an extent you can call this concept as the more dramatized version of S-Class. Dashboard looks extremely innovative with its configuration while the blue ambient lighting adds numerous stars to its elegant look. Over the dashboard a white flat bottom three-spoke steering wheel covers the instrument cluster. The interior is primarily upon the touch based controls. The entire interior comes dipped in either Anthracite Gray or white, contrasting each other with their presence and thus amalgamating the blue ambient lighting to make the overall look beyond imagination. In all the interior of Mercedes Benz IAA Concept 2016 for me, is innovative, never-seen-before and a sneak into the future of automobiles. As I mentioned earlier model provides you two in one. 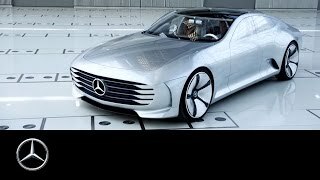 The exterior of Mercedes Benz IAA Concept 2016 is true example to it. It has been created with extreme aerodynamics in mind. You can notice the headlamps and fenders integrating into the bodywork; an experiment with aerodynamics. With its drag coefficient touching to a Cd value of 0.16, the model is one of the most aerodynamic cars ever introduced in the history of automobile industry. The front fascia of model is adorned with a massive grille with four slats running horizontally. The integration incorporates LED strips playing the role of headlamps. Moving towards back you will notice sloping roof, a split screen and the taillights being incorporated in the horizontal bars. 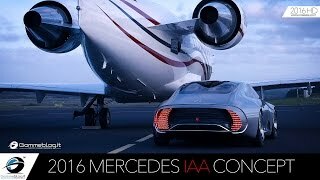 Rounding up the exterior of Mercedes Benz IAA Concept 2016 all I would say is, it is beyond the imagination in terms of looks and aerodynamics. Powered by a plug-in hybrid drivetrain, beneath the gorgeous hood of Mercedes Benz IAA Concept 2016 sits a gasoline engine and an electric motor. 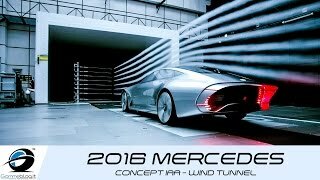 Not much has been disclosed in output figures but yes we do know that the total output of system touched 279 hp and can take the top speed of Mercedes Benz IAA Concept 2016 to remarkable 155 mph. We expect you to stay connected till company reveals more about the performance of Mercedes Benz IAA Concept 2016.